BOOK: If someone clicks on me, it could really hurt. I could end up with internal bruises that will take forever to heal. I understand what you mean. Whenever I stub my toe, I’m afraid I’ve broken my pinky bone. Or if I reach for something and feel a pain in my back, I worry I’ve torn a muscle. BOOK: And that’s not the worst of it. What if someone clicks on me, and then, as I’m on my way traveling to Amazon.com I pick up some kind of internet disease? Something with strange chemicals. I don’t want to get sick. I know what you mean. I don’t like flying in my older age because I’m afraid I’ll contract a disease. And I don’t like visiting foreign countries because I fear I’ll come down with a virus and I’ll be too old to fight it off. BOOK: So, if you understand my feelings, why do you want people to click on me? Why are you torturing me by sending me across the internet? BOOK: Alright. I can’t argue with you. How much clicking is involved? BOOK: Stop! That’s too much clicking. BOOK: Okay. I’ll do it for you. I appreciate it! Virtual friends, I hope you’ll take a look at my new book. And if you need to click on the book cover, please do it gently. BOOK: Thank you for your consideration. this is such interesting and great post!!! I am reblogging on TheBlackWallBog AND SIWO! Will be anxiously awaiting my copy! But definitely a must have! A superb find from an extremely talented writer! Wow Elaine, that means sooo much to me! I really, really, really, really hope you enjoy it. 🙂 🙂 We’ve come a long way creatively, you and I.
It’s my great pleasure. I enjoy experiencing the creative process with you. Yipeeeee!!!!!!!!!!!!!!!!!!! I’m so happy, grateful and flattered. You just made my Mother’s Day. Get tough book! You can do it. 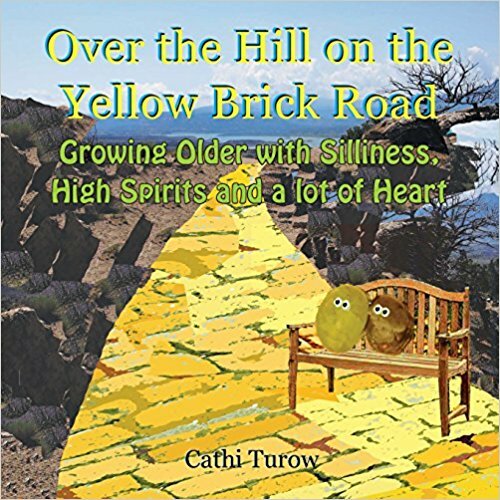 Cathi, writes about a lot of issues of aging in a hilarious but inciteful manner. She reminds me of Erma Bombeck. I am sure if you purchase this book you will throughly enjoy her unique stories. God I miss book stores! Ha ha! There are one or two still left in the world. Congrats on the book, Cathi. Congratulations on your book! Happy Mother’s Day! Wow! You did it! Congratulations 🙂 Those red shoes must be dancing up a frenzy on that yellow brick road. I will click gently – but just remind the book that lots of gentle clicks will make her click-hardened. Which is a good thing. I will pass on your important advice to the book. I’m sure it will be much appreciated by every page. Happy Mother’s Day! Congratulations in the “birth” of your book! I love all of your conversations on the yellow brick road, and it’s so exciting to have them collected in one place. Sounds like a perfect gift for self, friends, and for a fun beach read! I dind’t know you had a book out! Congratulations! I will check it out…gently. So glad you have made a book, I have no doubt it will be great, and I think it will make very nice gifts for friends of mine. Congratulations and Happy Mother’s Day! Thanks so much, Jen! Happy Mother’s Day to you too! Thanks Maria! I just took your suggestion. Happy Mother’s Day! I ordered it with the greatest care and delicacy – I did not press but rather stroked in the way I would stroke a tiny bird or that darned frog that keeps jumping in the pool and won’t stay in the pond and whom I am convinced is actually a slightly retarded prince but I can’t bring myself to kiss for fear I am simply deluded. I will be watching the mailbox with the intent expression of an aging bridesmaid with her eye on the bridal bouquet for the next two days! Hi! I’m so excited the book will be arriving in your home! I’m beyond flattered and hope it brings you a lot of joy. And! Thank you for being gentle when you clicked. You probably saved the book a trip to the Emergency Room. I look forward to reading your new posts, so get to it! And stroke the frog. He probably is an awesome, offbeat prince. I have absolutely no doubt that I will be delighted and brimful of joy with this book – no doubt whatsoever and I could not have born causing injury or trauma to it. I understand anxiety very well – gentle treatment is necessary in most of life (including popping champagne corks – those most exuberant of celebration makers). I am sure you are right about the frog and let’s face it – offbeat Princes are not to be passed by! Offbeat is the best. Who needs someone normal? Thank you, Jill! I hope the book looks fun to you! It does look fun. Having followed your writing on your blog, I know it will be well written. Ordered and ready on my Kindle for me to start reading. (I prefer paper, but the Canadian prices are just too nutsy.) I look forward to being your first Canadian reader and reviewer, Cathi. I’m finishing a novel tonight and will start your book tomorrow. Can’t wait! P.S. – I am always, always gentle. I can read a paper book a dozen times and it will still look new. Book, nothing to worry about – my clicking finger is soft too. I clicked (gently) and my copy is on the way! I can’t wait! Oh! I’m so excited! I’m so happy and flattered and thrilled that you’re going to have a copy of the book! It comes from my heart. I hope you enjoy it! well congratulations! I love the title-and will look forward to reading it! Best wishes! Thank you so very, very, very, very much Michele!!!! Congratulations on the book, Cathi. I know it will be delightful! Received my copy yesterday! I am beside myself with hilarious joy and laughter. Of course it also hit’s that special spot where love lives. And to think I did not expect anything less but received so much more!! ❤ <3. 🙂 🙂 🙂 🙂 🙂 And five smiles. I just noticed, you did it!!!! It looks so beautiful!!!!! Thank you so very, very much! I did celebrate! Thank you so much! Yay!!! Your book is out! Congratulations! I’m so excited for you! Thank you soooooo much! I’m excited too! Thank you so very much da-AL! Deeply appreciated. Fun conversation and piques our interest to go CLICK. No internet germs allowed.